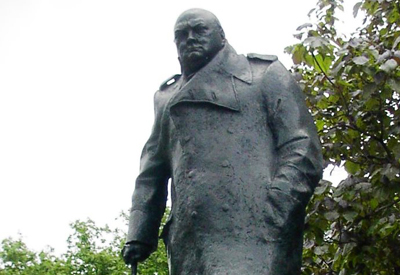 Former British PM, Sir Winston Churchill, died 50 years ago tomorrow, so we thought it was a good time to take a look at one of London’s most iconic statues. Standing tall among some of the towering figures of British politics (and others), the over life-sized bronze statue of Sir Winston Churchill on Parliament Square in Whitehall was designed by Welsh sculptor Ivor Roberts-Jones and is located on a site on the square’s north-east corner chosen by the great man himself. Standing 12 feet (3.6 metres) high on an eight foot (2.4 metre) high pedestal opposite the Houses of Parliament (which he faces), Churchill, who was 90 when he died, is portrayed during the years of World War II wearing a navy greatcoat but wears no hat and leans on a cane.